If you or a loved one has suffered a personal injury from an accident where another was at fault, you are legally entitled to compensation for medical treatment, property damage, lost wages, physical, mental and emotional suffering and more. However, it’s vital to know what your legal rights are so they are protected. Otherwise, you might receive a much smaller personal injury settlement than you are entitled to. That’s where Glendale Law Group comes in. As personal injury attorneys, we know this area of law inside and out. We’ll guide you through the process, advise you on your treatment options, do the paperwork and deal with the parties involved so you don’t have to. In California, where most people drive cars, SUVs and trucks to get around, automobile accidents happen frequently. If you are involved in a motor vehicle accident where you were not at fault, you are entitled to compensation for the harm it has caused you including medical treatment, damage to your vehicle, physical and mental suffering and more. You might receive an offer from the responsible party’s insurance company. Keep in mind the insurance company will act in its own best interest—not yours—and offer you the least possible amount of money. Call Glendale Law Group immediately for a free consultation at (818) 856-0099 or complete the form below. We’ll tell you what your rights are, recommend the best course of action and estimate how much compensation settlement should be. As motorcycles provide little protection from other vehicles, motorcyclists and their passengers are at risk of severe personal injury from an accident. Most motorcycle accidents are caused by negligent or distracted automobile drivers as well as road hazards. If you’ve suffered personal injury in a motorcycle accident which was not your fault, you have the right to compensation from the responsible party. Legally, you should be compensated for medical treatment, vehicle damage, physical and emotional harm, lost wages and possibly much more. Call Glendale Law Group immediately for a free consultation with one of our personal injury attorneys at (818) 856-0099 or complete the form below. We’ll let you know what your rights are, review your legal options and estimate your potential settlement amount. An injury is considered catastrophic when it causes significant damage to an individual’s ability to function physically, mentally or emotionally. This could include severe injury to the head or brain, broken or fractured bones, paralysis and other nerve damage, extensive burns, organ damage and more. The cost of medical treatment alone could be financially devastating. If you’ve experienced catastrophic injury from an accident in which you were not at fault, you have the legal right to compensation from the responsible parties. While compensation won’t make up for the trauma of a catastrophic injury, you should be compensated for the physical and emotional suffering and a lowered quality of life. Call Glendale Law Group immediately for a free consultation with one of our personal injury attorneys at (818) 856-0099 or complete the form below. We’ll inform you of your rights, your legal options and estimate your potential settlement amount. 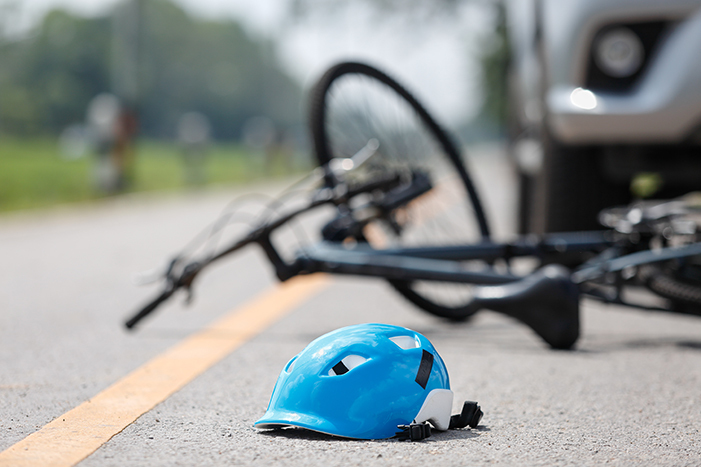 Bicyclists are particularly susceptible to personal injury in an accident with a motor vehicle. All too often, drivers simply don’t see the bike rider until it is too late. Unfortunately, these accidents can result in severe personal injuries and even life-long disabilities. If you’ve had a bicycle accident and you were not at fault, you have the right to compensation for medical treatment, damage to the bicycle, lost wages and any other harm to your physical or mental well-being. Call us now for a free consultation at (818) 856-0099 or complete the form below. We’ll review your case with you and advise you on the best course of action to take. We’ll also estimate what your settlement amount should be. “Slip and fall accidents” occur when an individual slips or trips and falls. The cause could be slippery, wet floors or walkways, damaged floors, icy or uneven sidewalks, defective stairs, torn carpeting, dim lighting and so on. Slip and fall accidents can cause a range of injuries, some of which can be quite severe. If you’ve been injured after slipping and falling on another’s property—whether publicly or privately owned—the property owner is legally obligated to compensate you for medical treatment, lost wages, physical and mental suffering and more. Call Glendale Law Group now for a free consultation at (818) 856-0099 or complete the form below. We’ll advise you on your legal rights, recommend the best course of action and estimate your settlement amount. As California is a coastal state, boating accidents are very frequent here. They can involve any type of craft including sailboats, motor boats, cruise ships, ferries and jet skis. Unfortunately, most boating accidents stem from operator error. If you’ve been injured in a boating accident and you were not at fault, you are entitled to compensation from the responsible party for medical treatment, damage to your boat and other property, lost wages, physical and emotional suffering and more. There is no reason why you should pay for another person’s carelessness. Call Glendale Law Group now for a free consultation at (818) 856-0099 or complete the form below. We’ll explain your rights, advise you on the best course of action and estimate your potential settlement amount. Even the friendliest of dogs can become frightened or agitated and suddenly bite someone. In California, dog owners are responsible for any harm caused by their dogs biting human beings. If you have suffered personal injury from a dog bite, you should seek immediate medical care. After receiving the treatment you need, call Glendale Law Group immediately to discuss your options in a free consultation. Legally, you are entitled to compensation from the dog owner for any medical treatment, lost wages, physical, emotional or mental suffering and more. Call Glendale Law Group now for a free consultation on your case at (818) 856-0099 or complete the form below. If the dog owner has already offered you a settlement, let him or her know you want to check with your attorney first. Then give us a call and speak to one of our personal injury experts for free advice and an estimate of your settlement.